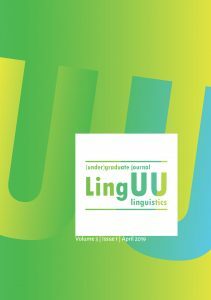 LingUU is the official, peer reviewed, student journal of Linguistics at Utrecht University (UU). In this journal, both undergraduate and graduate students can publish their papers. Students sometimes come up with ideas that are worth sharing, and develop creative theories that more people should read, other than just the teacher. LingUU provides a way to make this happen, while giving students the opportunity to get to know the world of academic publishing small-scale. Apart from the author-side of publishing, the journal offers students the possibility of developing the skill of peer reviewing in a real setting. Students who want to participate even more actively can apply for a position in the editorial board. The journal features articles from all subdisciplines of linguistics and publishes in both Dutch and English. Apart from research articles, LingUU features articles on internships abroad, and book notices or reviews.